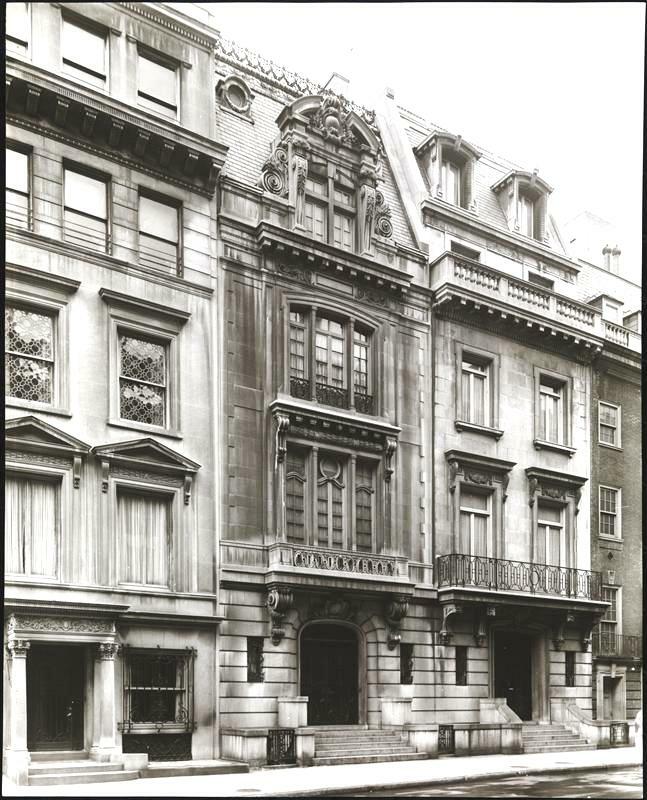 At the turn of the last century, as New York’s millionaires crept up Fifth Avenue, erecting grand limestone and marble residences facing Central Park, others bought up the stilted brownstone homes along the side streets built a generation earlier. The old dwellings were either renovated beyond recognition, or demolished to be replaced by modern, fashionable mansions. Joining the trend was Edward Nathaniel Herzog and his wife. Herzog was a partner in Johnson, Cowdin & Co., a silk ribbon manufacturer. The highly-successful firm ran a silk mill at 25 Grand Street, another in the silk mill town of Paterson, New Jersey and one in Norwalk. The New York mill alone employed about 125 workers, including fifty weavers. Two years earlier Felix Warburg had announced his plans to erect a gargantuan French Gothic palace on the corner of Fifth Avenue and 92nd Street, a block from Andrew Carnegie’s mansion. His father-in-law, Jacob Schiff, was aghast. He warned Warburg that the ostentatious style would spur anti-Semitic criticism and urged him to build a more restrained Italian Renaissance mansion. 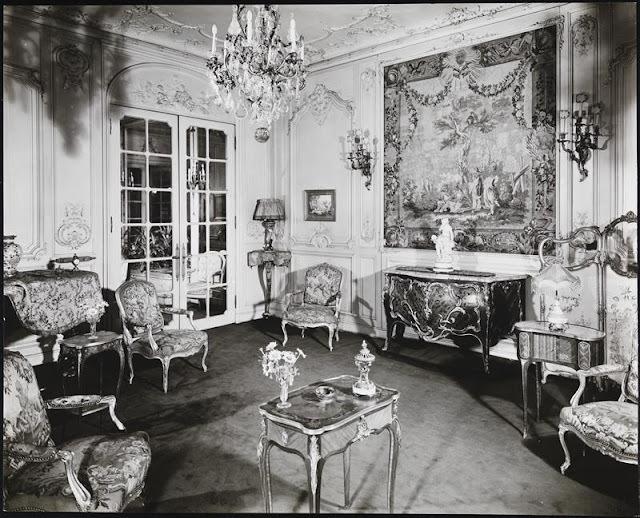 Warburg pushed on with his plans and as the Herzogs met with architect George I. Heins, his monumental chateau rose (and would continue to for another eight years). The Herzogs had neither the immense wealth of Warburg nor his grandiose ambitions for their home. 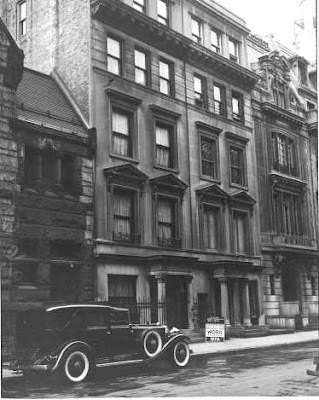 What Heins produced for them a year later, however, was a magnificent Beaux Arts mansion in the latest fashion. The grand brick and limestone structure did not apologize for the owners’ wealth; but simultaneously melded comfortably with the homes of the millionaires that surrounded it, calling little overt attention to itself. The home had all the expected elements of the time: A rusticated base above a short flight of steps, a second floor carved stone balcony supported by two large scrolled and festooned brackets, French doors and graceful ironwork. But the lavish dormer that sprung from the steep slate-tiled mansard stole the show. Swirling scrolls and a broken pediment stuffed with lush French carvings demanded attention. Atop the mansard was exceptionally elegant cresting. 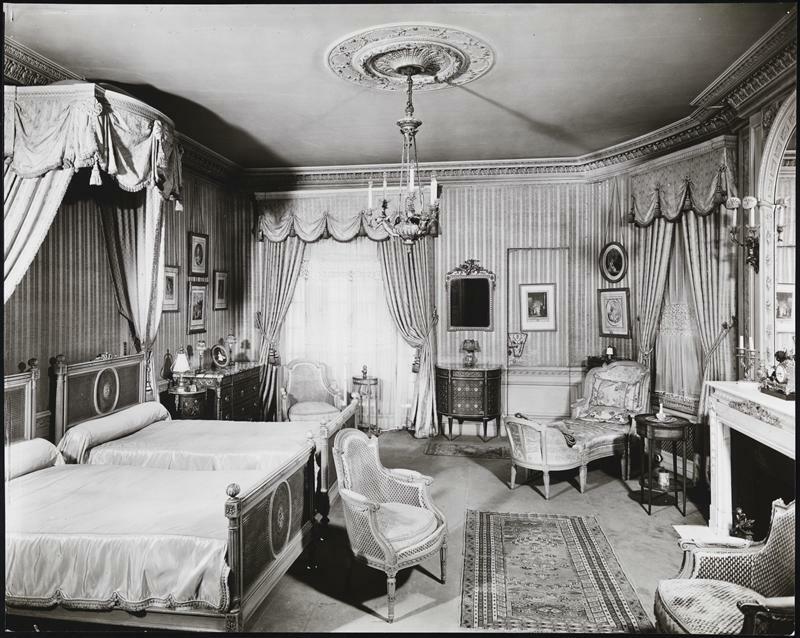 The rooms Inside the Herzog home, like the other mansions near the Park, were a mixture of periods and styles. French paneling and carpets defined the more feminine rooms—salons, boudoirs and sittings rooms. Asian porcelains, antique furniture and the requisite collection of European oil paintings were all moved into the house in 1901. While the Herzogs were socially active, they focused their attention on their favorite causes. Mrs. Herzog was active in the Hebrew Technical School for Girls and Edward was a trustee of the Metropolitan Museum of Art. She busied herself, as well, with her collection of antique French fans. In the meantime, Herzog’s firm was in the forefront of innovative workplace practices. It held annual “socials” for the hundreds of mill employees and was the first in the industry to hire a full-time osteopath to tend to injuries or illnesses. In 1904 Edward Herzog recognized a problem in the ribbon producing industry. American workers had become complacent. In addressing the annual meeting of the Silk Association of America that year, he sounded the alarm of foreign imports taking over. A century later Herzog’s words could still be considered current. Following Edward Herzog’s death, his wife lived on alone in the handsome mansion until her own death in 1939. In March of that year the Park-Bernet Galleries held auctions in the house. With no children or close relatives to inherit the Herzog property, the entire contents of the mansion were put on the block. The New York Post, on Saturday March 25, noted “The furniture is in the style of the French eighteenth century and includes occasional tables, commodes and writing desks beautifully inlaid with marquetry and a suite of four chairs and settee covered in eighteenth century Aubusson tapestry. Although the Great Depression was still in its final year, the first day of the auction alone grossed $14,865—about a quarter of a million dollars today. Two decades after the Herzog Estate sold the mansion, the Republic of Cameroon became a member of the United Nations. The fledgling country purchased the Herzog mansion and today it is home to the Permanent Mission of the United Republic of Cameroon to the United Nations. With only minor, expected changes, the Herzog mansion is beautifully preserved, both inside and out. A striking monument to a ribbon manufacturer who announced his arrival in society.